Bridalbuyer.com is the online portal for the bridal industry with all the information bridal retailers need to run their business – whether they’re selling bridalwear, formal menswear, mother-of-the-bride fashions, evening/prom wear or accessories. Bridalbuyer.com has a fully searchable, categorised Brands Directory, which contains comprehensive information about bridal manufacturers, media and other industry providers; with direct links to their website and social media pages. The site is updated daily with new collections and products, a calendar filled with global trade shows and events, the latest market news, expert industry comment, forums, news alerts and more… all helping deliver a loyal and growing community of site users. With over 120,000 visits a year, bridalbuyer.com provides a range of online services to benefit both readers and advertisers. The right audience – your message will reach the desktops of thousands of bridal retailers across the UK and Republic of Ireland. In total, in 2016, 173 countries logged into bridalbuyer.com. The right impact – the site will be heavily marketed all year round, giving your ads maximum exposure. The right opportunity – you can choose from a full range of online banner ad spots, media-rich MPUs, an enhanced listings directory and sponsored email news. For over 25 years, Bridal Buyer has been serving the industry by providing widely read and highly respected editorial. 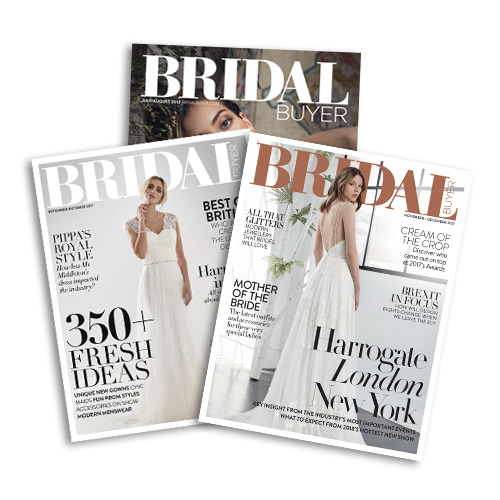 As the UK’s leading bi-monthly magazine solely dedicated to covering the bridal industry, the magazine gives advertisers unparalleled access to virtually 100% of the UK bridal market. Bridal Buyer is the official magazine of, London Bridal Week, White Gallery and The Harrogate Bridal Show, which gives you unique access to all show visitors.